2018 playbill features rock-opera Jesus Christ Superstar; a world premiere of Dutch Mason and Stories from the Red Dirt Road. (Charlottetown, P.E.I.) — Confederation Centre of the Arts has announced a sensational lineup for next summer\’s Charlottetown Festival. The 2018 Festival will run June 7 to September 22 and include the 54th season of the international sensation Anne of Green Gables-The MusicalTM; the phenomenal rock-opera Jesus Christ Superstar; two new Festival-spawned musicals, Dutch Mason and Stories from the Red Dirt Road. Jesus Christ Superstar is a global phenomenon that has wowed audiences for over 40 years. It\’s a timeless rock opera set against the backdrop of an extraordinary and universally known series of events but seen, unusually, through the eyes of Judas Iscariot. Artistic Director, Adam Brazier is thrilled to be at the helm as director to put his creative stamp on the iconic piece. “The themes of this timeless classic remain universal, their resonance today is palpable, as western civilization wrestles with existential questions about where power is held, where it should be held, and how fame affects the balance,\” said Brazier. Presented in tandem with Jesus Christ Superstar is the Island Festival\’s crown jewel, Anne of Green Gables-The MusicalTM. With a company of 23 amazing triple threats from across the nation, this iconic musical has delighted more than 2.5 million people over 2,500 times at the Centre, and remains the quintessential Canadian musical. At The Mack, Dutch Mason, inspired by the non-fictional book \”On the Road with Dutch Mason\” by David Bedford and Harvey Sawler, will take audiences on a fictional tour through Atlantic Canada with The Prime Minister of the Blues. When Dutch Mason\’s regular harmonica player is sidelined, a political science professor and amateur harp player is recruited to join Dutch and his band on a historic road trip that will shock the professor out of his buttoned-down conformity. Also at The Mack is Stories from the Red Dirt Road, adapted by our beloved festival regular, Marlane O\’Brien, from the book \”And My Name Is…Stories from The Quilt\” by Margie Carmichael. This is a funny, inspiring, heartfelt piece of four Island stories woven together through song and the red dirt road itself that joins our lives together. 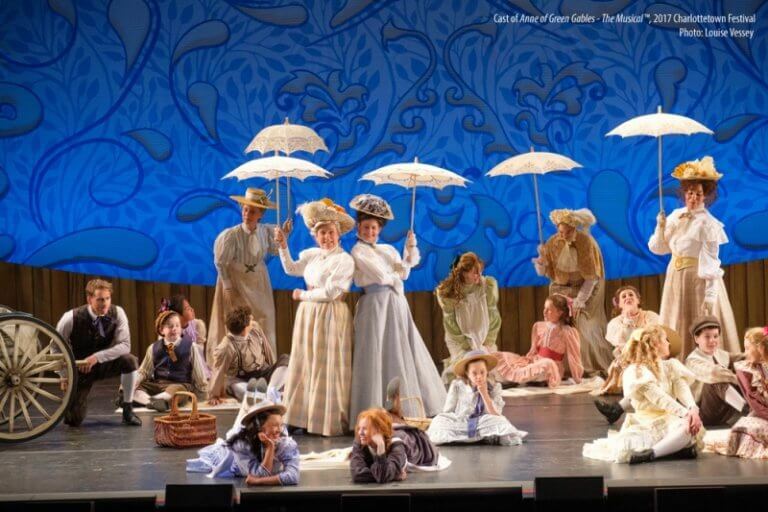 • Anne of Green Gables-The MusicalTM: June 18 – September 22 (1:30 p.m./7:30 p.m.) – Homburg Theatre.